PlusUrbia Design’s vision to create a parklet out of parking spaces in Little Havana has been awarded grant funding via the 2016 Public Space Challenge sponsored by the Miami Foundation. The Coconut Grove-based studio’s proposal for a low-cost, high-impact urban oasis was chosen from more than 400 submissions. PlusUrbia is known for its urban interventions in Little Havana, including myCalle8.org complete streets redesign of Calle Ocho. The studio’s La Terracita parklet would create a public gathering space — to play dominoes or hang out. 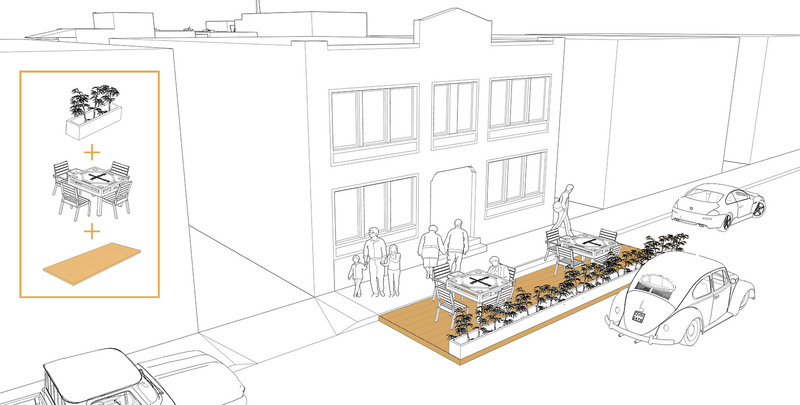 The parklet would be a gift to a densely-populated area, a neighborhood with one of the lowest indexes of open space per capita in the country. The Public Space Challenge Grant is for $20,000. PlusUrbia has committed to reach out to non-profits, businesses and individuals to leverage the grant. An equal match would fund all permitting, construction, liability coverage, ADA access, and maintenance of a successful urban parklet. Parklets can be replicated throughout Miami to create welcoming open spaces in urban areas. The ultimate goal is to collaborate with advocacy groups to produce a simple guide that would enable hundreds of parklets to be created.